Elevation: minimum 655 feet, maximum 1120 feet. Area Habitat: open land 2.40%, forest 97.54%, wetland 0.00%, open water 0.00%. Open under statewide regulations for all hunting and trapping seasons. Bear: Cumberland County portion is Zone 3. See the Black Bear Hunting page on this website for more details. 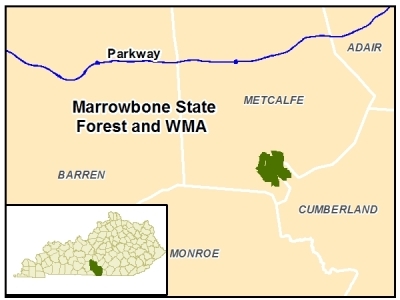 Marrowbone State Forest and WMA is located west of Burkesville, off KY 90. From Glasgow, Cumberland PKWY (Louie B Nunn PKWY) exit 14, take KY 90 (southeast) 20 miles to near the Metcalfe/Cumberland county line. The main entrance is on the left (north) side of the road. There is additional access parking along Gordon Branch RD, Ed Turner RD, Lone Star RD, and Muse RD. Terrain is steep to very steep with narrow ridge tops and bottoms. The area is mostly in upland timber with some pine scattered throughout, and 50 acres of open bottomland. The shallow soils are somewhat excessively drained, shaly, and highly dissected. Populations of deer, turkey, squirrel, and furbearers exist on the area. Open to statewide hunting regulations. ATVs and horseback riding are prohibited. Co-owned by Kentucky Department of Fish and Wildlife Resources and Kentucky Division of Forestry.